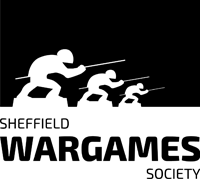 The official web presence of Sheffield's oldest wargames club! All members who have provided an e-mail address should have received a copy of the latest edition of the newsletter, which includes the minutes of the committee meeting held on 10th April and notice that an EGM will be held at Woodseats WMC at 7.30pm on Wednesday 31st April 2019 to discuss relocating the club. Sheffield Wargames Society is holding a bring and buy day as part of its meeting on Wednesday 17th April 2019 from 7.00pm at Woodseats Working Men’s Club, The Dale, Sheffield, S8 0PS. For those who want to sell six foot tables are available for £5 (SWS members pay £1 but are asked to contribute an additional 10% of their takings). Goods should be labelled clearly with details of price and vendor. Sellers may either man their table or rely on the honesty of purchasers. GOODS ARE LEFT AT THE OWNER'S RISK, AND NEITHER SHEFFIELD WARGAMES SOCIETY OR WOODSEATS WMC ACCEPT ANY RESPONSIBILITY WHATSOEVER FOR ANY LOSSES OR DAMAGE SUFFERED. All members who have provided an e-mail address should have received a copy of the latest edition of the newsletter, which includes details of Chillcon this weekend. all content copyright Tim Gow and Sheffield Wargames Society. Picture Window theme. Powered by Blogger.